On 23rd May 2014, a small canister of expanding foam started a blaze in the basement of the Charles Rennie Mackintosh building at the Glasgow School of Art (GSA). The fire quickly spread upwards, engulfing the iconic Mackintosh library and destroying some students' work moments before their degree shows. The world’s architectural community was heartbroken. The library, regarded as one of the most important interiors of the 20th century, lay in ruins. The School valiantly vowed to rebuild the library exactly as it was and charged the mammoth task to the newly forged Mackintosh Restoration Project Team, recruiting an in-house team of two conservation trained project managers to build around them a professional team of conservation accredited architects, surveyors and engineers. The project attracted widespread interest from the public, the media and even a number of celebrities; actors Brad Pitt and Peter Capaldi are both GSA Trustees. Two years on from the fire, Icon spoke to Elizabeth Davidson, Senior Project Manager on the Mackintosh restoration. Elizabeth shares news of the progress made so far, the challenges that lie ahead and the role of architecture on project and beyond. What has been your biggest challenge on the Mackintosh Project so far? I think (in a good way) the sheer amount of external interest in the building and finding time – amid getting the actual building contract underway – to satisfy the inexhaustible requests for external lectures or visits to the building in its current state. We have had an emergency and enabling contractor on site pretty well since the fire and it is important that we do not impede their progress nor put at risk any safety issues whilst also trying to accommodate reasonable access to this fascinating point in the building’s life when so much has been laid bare internally. The Mackintosh appeal has some high-profile Trustees. How important has this been in securing funds? I am sure that they will have had a significant effect. What has been completely extraordinary is the breadth of the response. I have never had a similar experience as the day after the fire at the Mack when people were phoning and writing into the School to ask where they could send funds to – before the appeal had even been launched! "The day after the fire, people were phoning and writing to ask where they could send funds to – before the appeal had even been launched!" As many folk have said since, if we had had a large enough bucket in Glasgow on 24th May 2014, we could probably have put it on Sauchiehall Street and raised pretty much all we needed in a matter of hours! We have already raised £17m towards a £32m target to help restore the Mack and convert the nearby Stow Buiding into a home for the GSA’s School of Fine Art. Some objects from the iconic library were salvaged. Can you tell us about the work happening in this area? Sadly, very little survived the intensity of the fire. Of the 10,000 books, only a dozen or so survived in such a condition that they were sent away for painstaking conservation – a process which is still underway as we speak. Fragments of timber furniture and structure survived and these are providing the design team with invaluable evidence as to materials, wood species, finishes, dimensions, jointing techniques, profiles and so on. All the debris was in itself archaeologically sifted and recorded by Kirkdale Archaeology and AOC Conservation, and that full record is still something we are using to inform the reconstruction. The only materials that did survive was, unsurprisingly, the metals. Cabinet hinges, escutcheons and locks mainly emerged and have been catalogued. More importantly, about 65% of the Mackintosh-designed light fittings, which were suspended from the ceiling of the Library, have survived and we are presently analysing with the help of HES and the University of Glasgow their exact metallurgical composition, surface finishes, strength and capability for repair and re-use. They also provide a kit of parts for templates for new light fitting to replace those totally lost. You have led a number of complex projects including the Merchant City regeneration. How does the Mackintosh Project compare? The current project was not of course ‘planned’; it was a disaster, an emergency, but the School has as one of its straplines ‘we thrive on disruption’ and it is certainly being tested on that now! The most striking difference is the amazing diversity and energy of the team that has been assembled by and from the Glasgow School of Art. Most notably, the vast reservoir of knowledge that the School itself can bring to bear on the project. 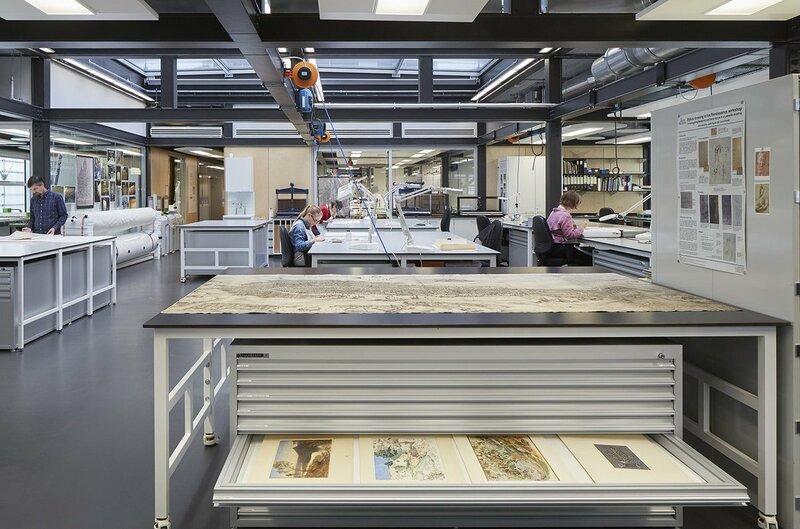 The archives department alone has one of the largest and most complete archives of any art school in the UK dating back to its founding in 1848. This includes meetings of the Board of Governors and the Building Committee that commissioned Mackintosh to engage on the design of the building, right down to the invoices from individual suppliers and contractors, and the plethora of small changes that were discussed in detail and minuted over the last century. It has proved a truly invaluable source for the design team in researching the evolution of the building and why and when certain changes were made. In addition, the School has appointed a dedicated research fellow, Dr Robyne Calvert, to work alongside the project team and her findings on topics such as the building as a pedagogical tool are informing the reconstruction in a really exciting way. The School also has an extremely active and engaged academic team that we work within. This is already manifesting itself with student work and projects based on the building and will result in a fine legacy of work that has been generated as a result of the trauma of the fire and the comprehensive re-thinking from first principles of how the school will re-occupy the building. What can we expect from the project in the coming years? How are you dealing with the public interest in the project? We want the Mack project to break new ground in term of engagement and wider public access. At present, there is a proposal which has been submitted for funding (the Digital Research Access of the Mack). It will encompass cutting-edge technology using our in-house Digital Design Studio to house all the many, many layers of information that are being generated on the Mack in all the various media of text, drawings, photography, film, blogs, scans on one interactive online site for the project. We are hoping for approval in June this year. Clearly, the project has played a big role in raising the public profile of conservation. Do you think the field can be somewhat opaque? Well, I think conservation is certainly a discipline that people move into once they have seen the light! By which I mean that it is a path that most professionals adopt after already qualifying in another more mainstream subject such as architecture or planning or surveying. I have just come back from a conference in Rome where the Mack was the focus of the event and it was really clear to all of us attending that, in Italy at least, being an architect encompasses archaeology, conservation, maintenance, new design and stunning contemporary intervention. There is no split and in fact they spent a lot of time talking passionately (it was Italy!) about the myth of the division that some countries impose on architecture especially. To the Italian architects we met, a typical day working in the Roman Forum could involve conserving a 2,000-year-old latrine, designing effortlessly in glass and steel, and overseeing the digital virtual reconstruction of a highly decorated temple – all achieved around a respectable two-hour lunch break! Help bring the Mackintosh Library to its former glory by making a donation to the Mackintosh Project.